University President Thomas LeBlanc will make stops at alumni receptions in five cities from coast-to-coast to detail his major priorities and connect with alumni over the next few months. University President Thomas LeBlanc is taking his new agenda on the road to alumni across the country. LeBlanc will be making stops at alumni receptions in five cities from coast-to-coast in the next few months to detail his major priorities and connect with alumni, parents of current students and donors. Presidential tours allow attendees to hear the president speak and can be useful in reconnecting with alumni who may have fallen out of touch with the university community, alumni engagement experts said. The welcome series started in January, when LeBlanc addressed alumni and parents at a reception in Philadelphia. He will hold similar events in San Francisco, Los Angeles, Boston, New York and Chicago in the coming months. While he is away from campus, LeBlanc said he would speak with alumni and families about GW’s major initiatives and University-wide aspirations. Matt Manfra, the interim vice president for development and alumni relations, said the events are being promoted to all alumni through social media, email and school newsletters. The alumni relations division, which is organizing the receptions, chose the cities with the largest populations of engaged parents and alumni for LeBlanc’s tour, he said. 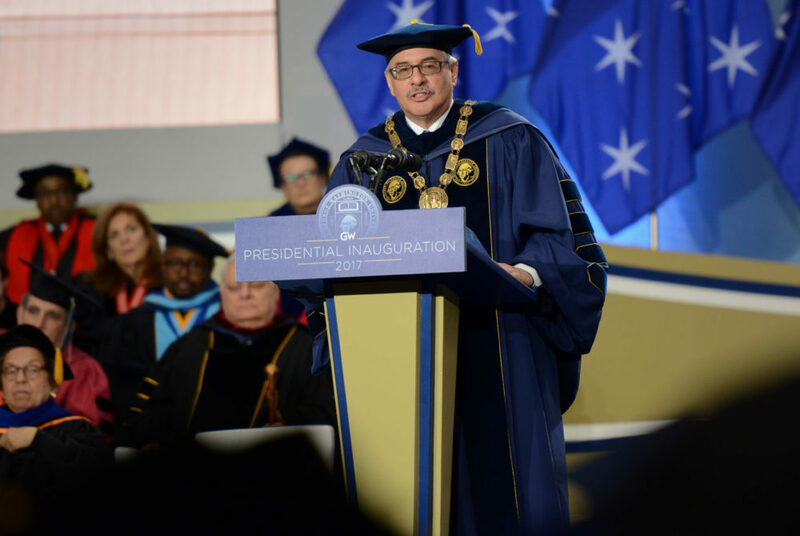 “These events are critical to build the pride and investment in GW that we want our community to embrace and share with future students and donors,” Manfra said. Manfra declined to say what kind of fundraising activities are associated with the events and declined to give details about travel and planning costs for the events. Venessa Marie Perry, the president of the Alumni Association, said former students often want to hear the goals of a university president from the man himself. “In-person events allow for dialogue so they can get to know him as an individual as well as GW’s leader,” she said in an email. LeBlanc’s initial goals for GW include improving the undergraduate student experience, reducing GW’s bureaucratic culture, strengthening research and focusing on University-wide fundraising. Jon Rodibaugh, the executive director of alumni relations at Rochester Institute of Technology, said universities often use data analysis and mapping to pinpoint areas with large alumni bases to host events. He said RIT uses these events to elicit donations, often encouraging gifts to specific programs, although there is also the option of donating to an annual fund. “We want our alumni to feel good and supportive of something they feel strongly about on campus. We want to help them support the things that are important to them,” he said. LeBlanc plans to build on former University President Steven Knapp’s efforts to increase alumni donations by reevaluating GW’s entire fundraising operation. Knapp often sought major donations on trips across the country and the world during his tenure. In the past, GW has had difficulty staying in touch with alumni and has struggled with an alumni giving rate below peer universities. LeBlanc hired a long-time colleague from the University of Miami to be GW’s vice president for development and alumni relations beginning in March. The cost of a presidential tour generally totals in the tens of thousands of dollars, Rodibaugh said. But universities may get donations to help offset travel costs. The trips are useful to engage alumni, but pull a university president away from campus, meaning there is less attention paid to current students and academic offices, he added. Wendy Kobler, the vice president for advancement at Wittenberg University in Springfield, Ohio, said a presidential tour is one way to “roll out” a president to highly engaged alumni. Presidential receptions reach out to the community by allowing alumni the opportunity to hear directly from the university president, ask questions and get an update about the progress the university is making, Kobler said. “I believe that it’s always important that presidents and the university staff re-engage alumni in the places that they are and where it is that they work and live and experience life,” she said.